Ah, the Santa Factor. The magical, rosy-cheeked bearded man who makes Christmas wishes come true. Skateboards, doll houses, Nintendos, puppies—you name it, nothing is beyond the big guy’s scope. And hence the conundrum: how to manage kids’ expectations without undoing the magic of Christmas or your budget. Space on Santa’s sleigh is at a premium, which means he only has room for one present per child. 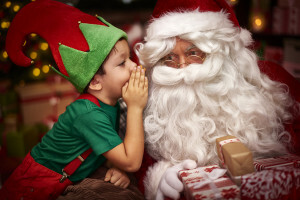 You can still give your kids extra gifts, but the one-kid-one-gift-from-FC policy alleviates applying the magical Santa factor to every present. Refocus your child’s attention on not just receiving, but giving too. Who are they going to make or buy presents for this year? Children who earn pocket money might be expected to set some aside for buying little gifts for, say, their grandparents. Smaller children might be helped to make something. Another way to involve your child in the spirit of Christmas is to include them in making a charitable donation. At most schools and shopping centres, you’ll find charities looking for toys and food for less fortunate families. Use the opportunity to explain that Christmas is also about sharing and helping each other. We can also help to deflect attention from the material aspect to the experiences of Christmas. Think back to your own childhood. I bet your fondest memories of Christmas are not of specific presents but of the fun times you had together—perhaps decorating the tree or going to see the Christmas lights. What special Christmas rituals does your family have? It’s never too late to start some. Of course, another option is to come clean and pop the Santa Factor like a balloon. Research shows that most kids cotton on at around seven but continue to believe because they enjoy the excitement! If the Santa Factor is causing you stress this Christmas, give the caring elves at MyBudget a call on 1300 300 922. We’re here to make Christmas memorable for all the right reasons.